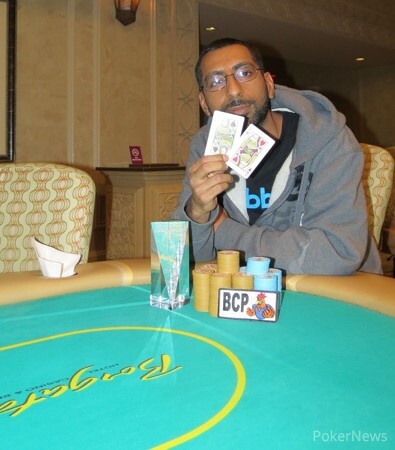 After a grueling heads up match that saw the lead go back and forth several times, Zo Karim is the champion of Event 16, the $330 Black-Chip Bounty Tournament, at the 2014 Borgata Spring Poker Open. He takes home an impressive $11,183 and the trophy for his victory. 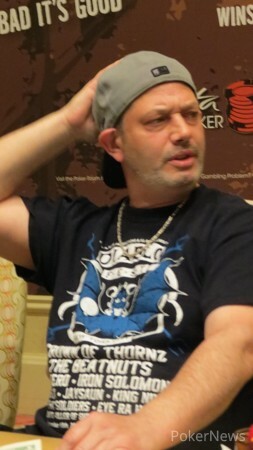 Karim joked afterwards that he is the best at heads up live tournament play. "I've never lost when I've gotten heads up in a live tournament," he told us. He recently won $68,000 two weeks ago in winning a 6-Max tournament down in Florida and now has over $825,000 in reported live tournament winnings over the course of his poker career. The biggest hand of the night for Karim came when he was facing a deficit against eventual runner up Steve Goose and would hit a full house with to crack Goose's . He would then eliminate Goose a few moments later with against Goose's . Karim outlasted a field of 206 entrants in this one-day no-limit hold'em tournament. The top 27 made the money with a 27th place finish being worth $360. They would make the money quickly and it was only once the final table was reached that things would slow down somewhat. Dan Heimiller would be another notable that would make the money and he would finish in 5th place for $2,398. Joining him at the final table was Tom McCormick who would be eliminated in 9th place for $799. Others that would make the money included Tam Minh Nguyen (3rd - $3,797), Stan Annis (4th - $3,077), Donald Nester (12th - $520), Daniel Welsh (21st - $360), and Amber Merefield (26th - $360). There is one last no-limit hold'em event scheduled during the Borgata Spring Poker Open and it will get underway later today at 11 am. It is a $230 Deep Stack tournament and we're expecting to have a great turnout. We'll be covering that along with Day 4 of the World Poker Tour Championship Event from start to finish. Be sure to check back for updates right here on PokerNews! It was a quick ending for Steve Goose who went from the lead to out in the space of two hands. The first hand saw Goose flat Zo Karim's opener from the big blind. The flop came and both players checked. The turn was the and Goose led out for a bet that Karim flatted. The river is when chips started flying. It was the and Goose led out for 300,000. Karim moved all in and was snap-called by Goose. Karim turned over the old four-deuce, , and Goose went on a mini-tirade, slamming the table multiple times and tossing his hat with vengeance onto the ground. Swear words lit up the room as he couldn't believe his luck. "I had Kings," he said, turning over . The very next hand the two would get it all in pre-flop and Goose once again had a big hand, , but this time it was Karim with his own big pair, Queens, with . The board ran out and Steve Goose was eliminated in 2nd place. Zo Karim has been conducting a masters class in heads up play and has chipped away at Steve Goose. In the process he has taken back the chip lead. Still anyone's game though. Zo Karim and Steve Goose are on a quick 10-minute break and Goose has close to a 2:1 chip lead. Tam Minh Nguyen picked the wrong time to make a move as he would get all of his chips in with and be up against the of Steve Goose. 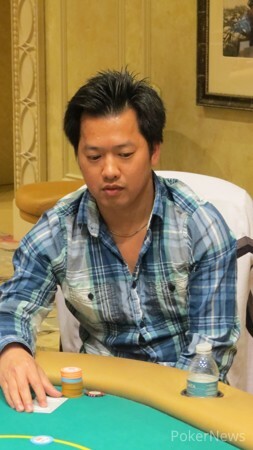 The board would run out and Nguyen was eliminated in 3rd place. Heads up action begins with Goose holding a moderate chip lead on professional poker player Zo Karim.